Pickleball is a game that is very similar to tennis but uses a smaller court, a paddle and a plastic ball. It is a easy game to learn and most new players are playing after just a few lessons. In addition, we play in groups where the players have similar skill levels. Come Join Us! The lessons are free and we provide all the equipment. Check out out our website for signup information. They say that pickleball is the fastest-growing sport in America, and if the Tellico Village Pickleball Club (TVPBC) is any indication, they’re probably right. Starting with a dozen or so players on a “borrowed” tennis court 14 years ago, the TVPBC ended last year with over 700 dues-paying members, playing on eight tournament-sized dedicated courts in a beautiful setting across from the Wellness Center. 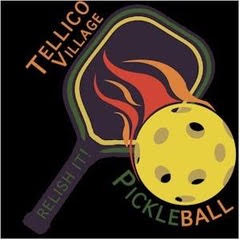 Pickleball is now one of the most popular activities here in Tellico Village. So what makes this silly-named sport so popular? Three reasons: First, it’s EASY; using a paddle to hit a ball back and forth is as basic as it gets. Next, it’s HEALTHY; pickleball can be a terrific aerobic workout, particularly when playing with people of similar skills (which is how we do it around here). Third, it’s FUN; with a playing court just a fraction of the size of a tennis court and with play being almost exclusively doubles-type format, friendly social interaction and banter is as much a part of the game as anything else. If you’re not already into this truly addictive sport then you owe it to yourself to try it, and the TVPBC invites you to do just that. Just sign up right here on our website and we’ll be right back in touch with you to schedule an Orientation Session, and you’ll be on your way.